Clockwise from top left: Jimi Tar Patrick, Thomas Charles Meo, Dean Andrew Finocchiaro and Mark Richard Sturgis. With an intensive search and criminal investigation underway in Bucks County, authorities have taken a "person of interest" into custody in connection with the disappearance last week of four area men. On Monday evening, police arrested and charged Cosmo DiNardo, 20, for a prior firearms possession offense from February. DiNardo's involvement in the disappearances was not immediately clear, though properties owned by his relatives were searched Sunday as part of the ongoing investigation. He is being held on $1 million bail. Earlier Monday, Bucks County District Attorney Matthew Weintraub said he strongly suspects foul play is involved in the current case. "It sure would seem so," Weintraub told reporters at a press conference in Solebury Township, where the investigation has been centered. Multiple local law enforcement agencies have been joined by the FBI in their search for the men, all said to have known one another prior to their disappearances, according to investigators. Concern first arose last Wednesday with the disappearance of 19-year-old Jimi Taro Patrick of Newtown Township. 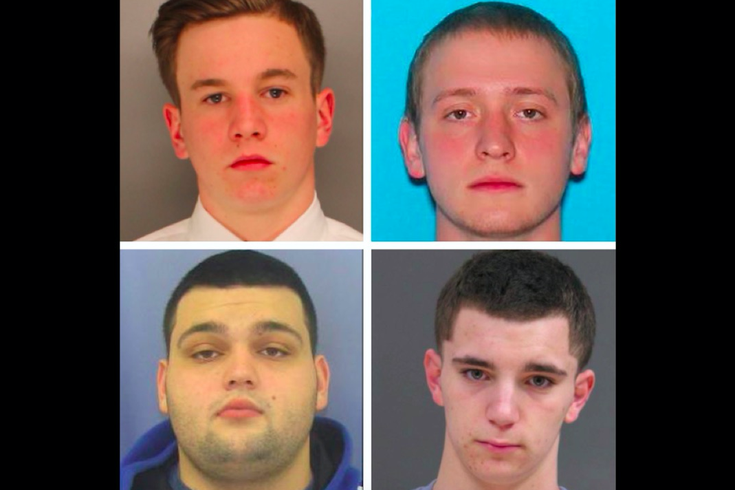 By Friday, three other men — Mark Sturgis, 22, of Pennsburg; Dean Finocchiaro, 18, of Middletown Township; and Tom Meo, 21, of Plumstead Township — all went missing as well. Two of the men, Sturgis and Meo, are longtime friends who work in construction for Sturgis' father, Mark Potash. Finocchiaro is a mutual friend of theirs, Potash told The Associated Press. Potash said he did not know where his son was heading or what he was doing before he disappeared Friday. Authorities chased fast-developing leads in their search Monday, but said it could take days despite intense efforts on a large swath of the DiNardo family's farmland. "The leads are incredibly hot, they're very fruitful," Weintraub said. "We're making great progress, but there's so much more work to do. We're not going to rest until we get through every inch of that property." Investigators have focused on several areas in Solebury Township, including the large property near Aquetong Road near Route 202. Meo's car was reportedly found in a garage Sunday night during the execution of a search warrant at a home in Solebury Township, according to Philly.com. Another property in Bensalem, belonging to the same owners of the Solebury Township home, also was searched, according to the Bucks County Courier Times. Public records indicated the properties belong to Antonio and Sandra DiNardo. Sturgis' father confirmed that his son's vehicle had been found at Peddler's Village in Lahaska, Bucks County, four miles from New Hope. At a Tuesday morning press conference, Weintraub said 50 people were assisting in the search at the Aquetong Road property. "We are still gradually sifting through the property," Weintraub said. "It’s 90-something acres, and we are going through it with the equivalent of a fine-toothed comb." An affidavit of probable cause obtained by 6ABC said DiNardo was allegedly found in possession of a Savage Arms 20 gauge shotgun and ammunition. The affidavit goes on to state that DiNardo is "known to suffer from mental illness" and had previously been committed to a mental institution. While the charge was dismissed by a district judge in May, prosecutors refiled it Monday as part of their investigation. Weintraub could not immediately say whether the four men remain alive. "I hope and I pray because that would be the best outcome," Weintraub said. "I just have to go wherever the evidence takes me." Anyone with information about this case is asked to contact authorities at 215-297-8201 or leave an anonymous tip on the District Attorney’s Crimewatch site.